Btw why doesn't Camillas nen beast interfere with her hatsu, suicide and all? Throw Camilla out of the playfield. If she dies, she auto kills whatever silly fool is casting the hands. And if not, one Caligula less on the list. It is probably the same "after death nen" thing, like the original creator of the pot, or the current king's dead brothers and sisters. If they absorbed competent nen users for dozens or hundreds of generations then fatso king might be more powerful than level 1 Meruem. Oh no, not Kachou. She was my favorite Prince. ...Mostly because the others were either boring, interesting but had little focus, or a baby. It was probably inevitable, but I wished we had spent some more time with them before they were killed off. Maybe a few less princes and more time spent on establishing them would have made the emotional impact greater. Still, I feel Fuugetsu and Kacho were among the more interesting princes. I'm a bit late, but this was an incredible chapter. I think this could very well be the best batch of chapters since the end of the Chimera Ant arc. Last edited by MrBits; October 7th, 2018 at 12:50 PM. This was an excellent chapter. The pacing and flow of the banquet, and the build-up to the end had me on the edge of my seat. I can't wait to see where we go from here. Togashi has a penchant for characterization and tension - and this arc continues to showcase that in spades. I'm really curious what will happen regarding Kacho's nen beast and how her presence will affect the relevant characters (Melody, Seiko, and Fugetsu). Kacho's death definitely hit hard, as they're the most sympathetic princes after Kurapika's plight with Woble and Oito. I assume that the nen beast is taking physical form through a conjuration ability, and everyone will be able to see her. It'll be interesting to see who, how, and when characters figure out the ruse. Even if Melody learns, I argue she wouldn't have the heart to tell Fugetsu off the bat - it would take some sort of breaking point to get her to admit the situation to the 11th prince. I'm also glad for the flashback panels in this chapter illustrating the conversation between Keeny and Melody in 381. At the time I was confused about it, but we weren't supposed to know what was being said. I want to bring attention to the flashback panel on the bottom right of chapter 383 page 13 (page 79 in the Viz SJ). I was initially confused about it and the phrase "pick up the numbers" so I did some research. I went to the HxH Reddit where I learned that Mizaistom's message to Melody in chapter 381 (page 3-4, or Viz page 9-10) had a hidden meaning. The Hunter talking to Melody said the time in an odd way which Melody noticed. The time was 1:44 or 13:44 military time. The first clause of the first statement in Japanese was "Princes Kacho and Fugetsu". The third clause in the second statement in Japanese was "to escape". The fourth clause in the third statement in Japanese was "it is a key part of your duty". The fourth clause of the fourth statement in Japanese was "assisting". Mizaistom was sending a hidden message to Melody "It is a key part of your duty assisting princes Kacho and Fugetsu to escape". He couldn't say so over official channels, but Mizaistom wants to prevent bloodshed as well. He can't get the Association directly involved, otherwise, it might start an additional conflict. I just reread this arc for the first time since it started releasing four years ago. I caught many details like the example above on this reread that I missed reading it weekly. The biggest issues with this arc are the density of information/new characters, compounded with the publication schedule and hiatuses. It makes it difficult - even for a big fan like me - to keep up with everything (without rereading the whole arc before every chapter run). 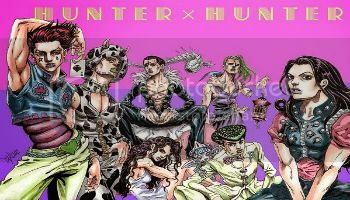 However, Togashi is *definitely* putting forth effort and planning into the plot, characterization, and art in this arc. TL;DR: Chapter was great, curious where it'll go next week, Togashi is putting in work regarding the plotting and characterization of this arc. Finally, we're getting back to serious business. Unlike the ant arc, there are great nen users on every sides. The chimera ant arc was way too much polarized around Meruem. Tsen awakened a new stand. What will it’s name be? Hey...maybe it's time to stop making Tserriednich stronger and stronger, he's already looking too powerful when he's just done with the basics. So far it seems that he might even reach the ants who were considered B overall according to this, and maybe even surpass them if he manages to become the next king and gets the backing of Kakin. Species: Chimera ants(Demi-human type), Ai, Brion, Zobae(Infected human), Hellbell, Pap, Human(Individual), Human(Nation). A - 1. Aggressively attacks humans. 2. Biology and actions of the creature puts large amounts of human lives in danger. Number: A - One nest, host, or group contains 10000 or more. B - Few hundred to few thousand. C - Ten to one hundred. D - Less than 10. B - 1. Reproducing several times in a year and their numbers are in 2 figures. 2. Depending on condition it may switch to level A. (Typo?) Distractibility: A - 1. Each encounter most likely results in death and it is hard to avoid. 2. Damage given will hinder everyday life, it is hard to heal and will leave permanent damage. B - 1. It is known how to avoid it, but failing to do so will most likely result in death. 2. It gives difficult to heal damage that stays for rest of the life. D - 1. It may leave permanent damage or scar that does not effect everyday life. 2. Damage can be healed completely in few weeks. E - 1. Proper medical care will heal the damage in few days. 2. It may indirectly effect small group of humans (limited contamination or evacuation). Total: A - The threat must be destroyed immediately; however, method is unknown. Requires entire world's cooperation. The double spread with Tserredich nen beast was pretty cool. That gotta be some relevant to jumping to the banquet and then going backward in time. Honestly, I don't really care for Tserredich and find him boring (I think Mereum is slightly more interesting than him and I didn't really care for him either). He's getting way too hax. He mastered nen in less than a week & now has two nen beasts. I'm not feeling the hype all those on reddit gives him. I'm also a bit confused with the whole situation in the prince room. Did he killed that person or someone did? Judging from how the furnitures seem to be blown away, it seem like that person just exploded? And he thinks Morena is responsible for it? So we're going down this rabbit hole again. And this chapter occurred on the 7th day as stated in the first page. Melody's performance was broadcast to the whole Tier 1. Mafia bosses have to make amends for their members immediately unless they are away, or else war breaks out between the groups was what the pages were saying right? It gets better. I like when little characters get some development. Release day common courtesy is to at least say that the chapter is out before going into a spoiler. So, this means that Benji and Camie might still be somewhere else on the ship. Honestly, the past 4 chapters have been pretty good. I have said it before but having less wall of texts really helps the overall flow of the chapter. I'm actually invested in reading the chapter and not dreading when he fills the whole chapter with endless wall of text. I'm still waiting for the chapter that editor hyped up. Slow chapter but does cover important things. Theta was definitely going to fail in the assassination of the prince. Good try. I figured she won't died but will suffer a fate worse than death. She will lied again which cause the nen beast turn her into something horrifying. Also, Melody's performance interfering with the assassination was going to happen when last chapter went back in time. Melody is one of my favourite side character from Yorknew arc. I'll miss her as he will probably kill/turn her into artwork. First chapter I've really enjoyed since his last break. The Princes' beast is just so creepy.